This excerpt is from the July-August 2010 issue of Harvard Magazine. Read a full report on the Baccalaureate service, including audio. 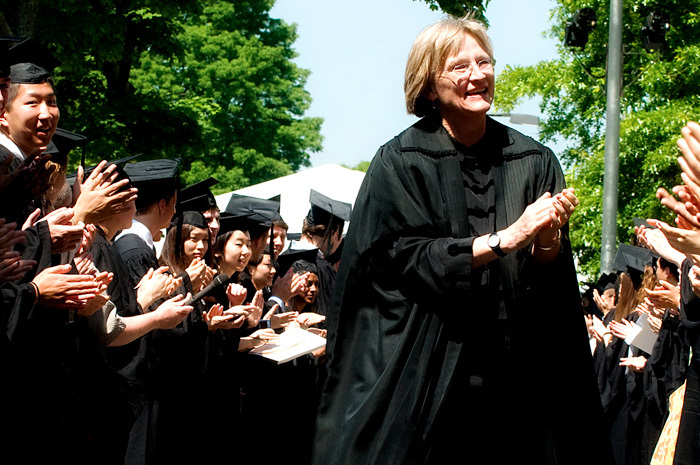 President Drew Faust addressed the graduating seniors on Tuesday afternoon at the Baccalaureate service. Her topic, “Living an Unscripted Life,” was timely and perhaps even, in this early passage, autobiographical, given the challenging world circumstances early in her administration. [T]he introduction to the Report on Gen[eral] Ed[ucation] tells you that, and I’m quoting, “the aim of a liberal education is…to disorient” and then “re-orient” young people, to expose them to “phenomena”--and I quote again--“that exceed their, and even our own, capacity fully to understand.” We seem to have done an exceptional job at this, with a little more outside help than anyone anticipated. [One thing is] humility. In case we didn’t know it before, we have been forcefully reminded that we cannot control or even predict the future or what it will require from us. Now a place with the word “veritas” emblazoned across the doors may not bring the word “humility” immediately to mind.…But this past year was humbling for all of us. And humility can be a very effective tonic. Humility, in fact, is what makes learning possible--the sense of ignorance fueling the desire to overcome it. The unforeseen events of the past two years have forced us to imagine the world differently; they have demanded that we adapt, and throw away the script we thought we were following. And they have reminded us once again of the value of the liberal arts, which are designed to prepare us for life without a script--for a life with any script. Since you cannot know what you need to be ready for, we have tried to get you ready for anything.